Break bad news to others without creating hard feelings. Influence with Ease ® applies equally well with external customers or internal co-workers. In this session no one feels left-out. When it comes to customer service expertise, Jeff didn’t just read the book – he wrote it! He’s the author of the best-selling business books, Becoming a Service Icon in 90 Minutes a Month and Influence with Ease. He heads his own training company and has written and produced 4 audio training albums. His Influence with Ease ® column has been syndicated and featured in over 200 business and on-line publications. Rest assured – you won’t be bored in a Jeff Mowatt presentation! 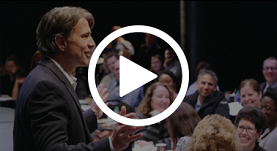 With over 20 years as a full time professional speaker, Jeff knows how to engage a group. He has served as the national President of the Canadian Association of Professional Speakers. The International Federation for Professional Speakers awarded Jeff with the highest earned speaking designation in the industry; the Certified Speaking Professional (CSP). Of the over 5,000 professional speakers in the worldwide federation, less than 7% achieve this highest degree of distinction. With a Jeff Mowatt presentation, your team members will learn and laugh. In other words, Jeff transforms a gathering into team-building, motivating experience. To reinforce his message, Jeff offers a full complement of coaching tools including: books, multimedia CDroms, online courses, and weekly 30-second training tips. Jeff’s was the best presentation ever!! It will have a very positive impact on me and our organization. Jeff’s session revealed how we can implement small changes to create big returns. You captivated the audience from the start and certainly planted the seed that they can easily become industry leaders in customer service. Our members appreciate real world solutions focused to their business and not listening to academic rhetoric. You delivered just that. Congratulations! Jeff motivated all of us to deal with each other and our customers in a professional manner – showing respect and getting positive results. Andrew Kidd, President, Devonleigh Homes Inc.
Jeff’s session was by far the best customer service presentation that I have participated in. He ensured that all the different areas of our organization were covered in examples and how our roles are important in making our customers feel good about themselves and coming to our facility. Jeff’s seminar provided a great start to make the changes we need to make – very helpful! Jeff’s session was great. It gives me the motivation and ability to sell myself and our products, and will bring more money into the salon. Jeff gave our group a better understanding of what motivates buying behavior and customer loyalty. Jeff’s is a great topic that targets everyone at each level of our organization. This session will make our hotel tremendous. It will provide an attitude adjustment and enhance our guest interactions. When we apply Jeff’s concepts about building trust, we are going to be even better at reception, patient management, diagnostics and delivery of therapy. Everything! From front to back.